Following the Nov. 13 release of Green Day’s second album in the trilogy iUno!, iDos!, iTré!, the saying “two is better than one” couldn’t be more true. Whereas the sound of iUno! was influenced by Green Day’s 1994 album Dookie, iDos! has the feel of a retro garage band. This can be explained by Green Day’s alter ego, Foxboro Hot Tubs, whose style of music has a punk garage band sound. iDos! can be compared to Foxboro Hot Tubs’ album, Stop Drop and Roll!!! Just as teenage boys sing lyrical duds in the arena that is their garage, several songs from iDos! seem lyrically immature. Songs like “Makeout Party” and “See You Tonight” act as fillers for the track list. Lead singer Billie Joe Armstrong’s voice is uncontrolled in the song “Makeout Party,” as well as the guitars accompanying him. “It’s a makeout party in another dimension, and it’s gonna get crowded with some bad intention,” Armstrong belts. The slow, mellow movement of the opening track “See You Tonight” is a dull way to start the album. The only reprieve that the listener has is that the song only lasts about a minute. The rap song “Nightlife” is the most surprising track from the album and feels like an attempt by Green Day to release a mainstream single. “Nightlife” is Green Day’s first rap song, and while it is the one oddball song on the track list, it is a rap song well done. Simple lyrics, a slow, reggae beat and a low tone allow this song to be easily rapped in a car by the most tone-deaf individuals. The tracks on iDos! are unlike the songs released on the previous albums American Idiot and 21st Century Breakdown. Both albums are rock operas, meaning that when played in the proper sequence, a story is told. The songs from iDos! do not fit together to tell a story, although the songs do follow Green Day’s punk theme of the lust of love and the pains of growing up. The lyrics are relatable for college teens struggling with self-discovery and relationships. “But time comes around and I’m not so naïve. I’ve finally lost touch cause you’re so out of reach,” Armstrong sings in the song “Ashley.” For someone going through a breakup, “Ashley” is the perfect “I’m over you” song. As for the horny listener, “F*** Time” will satiate your sexual cravings. “I’m the man that took your holy grace …. got dirty thoughts and a dirty mind,” Armstrong says. “F*** Time” is considered one of the more upbeat songs on Green Day’s newest album. In it, bassist Mike Dirnt delivers catchy guitar chords that lend a lightheartedness to Armstrong’s dirtiest desires. The most poignant song from iDos! is “Amy,” which is a tribute to Amy Winehouse, the British singer who died from alcohol poisoning in 2011. It is a heartfelt song that will win over even the most adamant haters of the beehive, cat-eye wearing singer. “Twenty-seven, gone without a trace, and you walked away from your drink. Amy, don’t you go. I want you around,” Armstrong sings while performing a solo with his guitar. Overall, iDos! delivers the punk that Green Day fans expect, and for those who have been long-time listeners, the style of music is nothing new. However, for the casual Green Day listener, only a few songs from the CD will be worth downloading from iTunes. 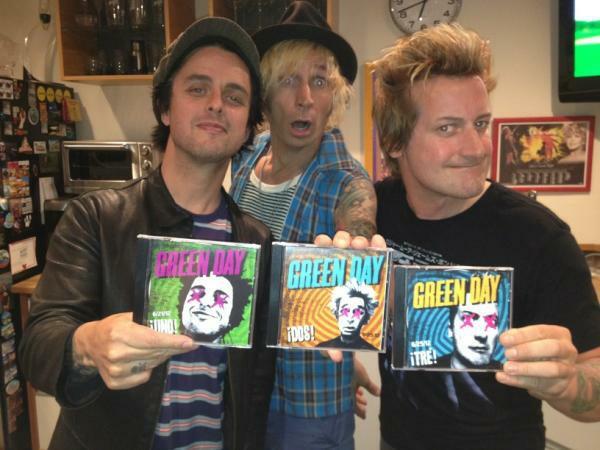 Songs like “F*** Time,” “Ashley,” and “Stray Heart” are most similar to songs from previous Green Day albums and will appeal fans. The tracks “Nightlife” and “Amy” are worth the $1.29 iTunes price for people outside the punk alternative genre. Whereas the album iUno! reminds fans why they fell in love with Green Day in the first place, iDos! is more experimental in sound and has the ability to reach across genres to gain new fans. iDos! was released in the wake of Armstrong’s admittance into rehab. For the Dec. 11 debut of iTré!, Armstrong, please take a cue from Winehouse, and the next time they try to make you go to rehab, tell them "no, no, no."